1783年约翰-查默斯先令 PCGS AU 55。1783 John Chalmers Shilling. W-1785. Birds, Short Worm. AU-55 (PCGS).；An exceptionally well produced and preserved example that certainly ranks among the finest known survivors of the type. Whereas many Chalmers shillings display less-than-perfect centering, the impression on both sides of this coin is ideally centered within uniformly denticulated borders. The definition to the devices is no less impressive, the design universally sharp on both the obverse and reverse. For the former we note uncommonly full detail to the clasped hands, while on the reverse the central motif with the birds, worm and snake is remarkably well rendered and fully appreciable. Smooth and attractive, the surfaces exhibit mottled steel gray and sandy-silver patina that further enhances already memorable eye appeal. 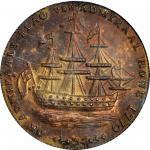 Coins of this type are attributed to John Chalmers, a goldsmith and silversmith in Annapolis, Maryland. Chalmers issued these coins to prevent some of the abusive practices associated with fractional parts of the Spanish dollar, those being the most widely used coins in the early United States. While it was customary at the time to cut Spanish dollars into halves, quarters and eighths, unscrupulous persons would attempt to make a profit by cutting five "quarters" or nine or ten "eighths" out of one coin. Chalmers solution to this problem was to redeem various fractional parts in exchange for his own coins, charging a commission for this service. 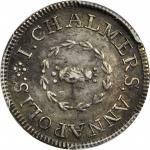 Examples were produced in threepence, sixpence and shilling denominations, the dies engraved by Thomas Sparrow, if not by Chalmers himself, and the coins struck at a building at the corner of Fleet and Cornhill streets in Annapolis. Given that several hundred Chalmers pieces are known today, and that most display significant wear from extensive commercial use, the issue appears to have been well received by the contemporary public and widely used in commerce.<p>In an absolute sense, of course, all Chalmers coins are rare irrespective of denomination or variety. Those most often seen are shillings of the bird type, the short worn variant a bit more plentiful than its long worn counterpart. Few are as expertly produced or carefully preserved as the present example, however, making this an ideal candidate for inclusion in the finest type set or specialized collection of early American coinage.；From the Antony Bettencourt Collection.